Open Letter to the New Zealand Ministry for Culture and Heritage re the European discovery of New Zealand. No II. I refer to our recent correspondence in respect of the European discovery of New Zealand and the updates to your venerable online resource in respect of the Portuguese and Spanish theories on the discovery of New Zealand. The forward thinking changes made by Te Ara sparked a welcome literary debate on the genre, with articles in the New Zealand Herald, Te Wahanui, and recently in the New Zealand Listener Magazine. About that ‘rubbish.’ The Portuguese or Spanish probably voyaged to New Zealand pre Tasman. A previous article in the Northern Advocate, also provides a good overview. The result: We are in the midst of an intelligent debate about the European discovery of New Zealand and Australia. The glass appears to be cracking around the negative stigma that has surrounded the theories on the Portuguese and Spanish discovery of Australia and New Zealand for the past 30 years. These theories appear to be moving from being presented as fringe ideas to being discussed in the mainstream as real possibilities. And they are now being taught and assessed as possibilities, probabilities or otherwise in schools and universities. Dr Ross Ramsay, for example, at the Southern Institute of Technology is leading the way in this regard, putting the literature in front of students and asking for their assessment. From my end, it is pleasing that societal knowledge and interest on this element of New Zealand history appears to be moving forward, and with that, further research will be completed, and the Portuguese and Spanish theories developed further. History wasn’t written in a day. Sincere congratulations to the team at Te Ara and the Ministry for your major part in inspiring this discussion and I do apologise for the delay in getting back to you, it has been a rather busy period with family, profession, and a recent charitable goodwill mission to Seychelles and Madagascar. The modern day Conquistadors have been active in the Indian Ocean. Further details can be found here, if interested. Now, to the updates in Te Ara on the European discovery of New Zealand. I do have some comments and a query for you, if I may, and propose some alternative text for your kind consideration. 1) The map presented in the encyclopedia is preceded by over 100 years by the Dieppe maps. In my earlier letter dated 8 October 2015 I previously provided comment that the map that commences this section on the website, the Henricus Hondius 1641 map, is not the earliest map of the Terra Australis Incognita or of Australia and New Zealand. I provided an alternative below based on the 228 year old, well researched theory, that the Portuguese and / or Spanish may have discovered Australia and New Zealand, a theory that has been taken seriously and believed by some of the top cartographers and historians of their time, from Alexander Dalrymple (1786); the British Admiralty (1803); Richard Henry Major (1859), George Collingridge (1895), José Toribio Medina (1918), Robert Langdon (1975 and 1988), Kenneth McIntyre (1977 and 1982), Dr Helen Wallis (1981), Roger Hervé (1983), and Peter Trickett (2007). Map curator, British Museum (later British Library) (1967-1987). Chairman of the standing commission on the history of cartography of the International Cartographic Association. President of the International Map Collectors’ Society (1986). Founder of The Geography and Map Section of the International Federation of Library Associations. President of The Society for Nautical Research, 1972-1988, and President of the British Cartographic Society. Question: I would be grateful if you could let me know what the reason is for the venerable national encyclopedia appearing to ignore these maps and the literature (particularly Wallis’ experienced view) surrounding them. Pending your response, and to assist, I have drafted for your kind consideration an alternative section for ‘The Short Story’ section, that provides a reasonable assessment of current knowledge and literature. In summary, I propose that the map that is currently presented in this section be removed as it is doesn’t represent current knowledge and literature. I propose it be replaced with the ‘Jean Rotz’ map of 1542, presenting the great southern continent in the global context, with a close up of the Vallard Map of 1547 to provide the New Zealand context. I also propose for consistency that a paragraph be added above the Abel Tasman section mentioning the Spanish and Portuguese theory – as it is included in the ‘long story’. In their search for the vast ‘terra australis incognita’ (the unknown southern land) thought to lie in the Pacific, explorers made daring journeys across uncharted waters. They did not find the fabled continent, but they did find New Zealand. Circumstantial evidence points to the possibility of the Portuguese and Spanish being the first Europeans to voyage to New Zealand, however the Dutchman Abel Tasman is first recorded as having sighted New Zealand, and the country was later mapped by James Cook, the British captain who dominates the story of the European discovery of New Zealand. Jean Rotz Circular Chart – 1542, which it is theorised includes some of the eastern coastline of Australia and some of the North Island of New Zealand. 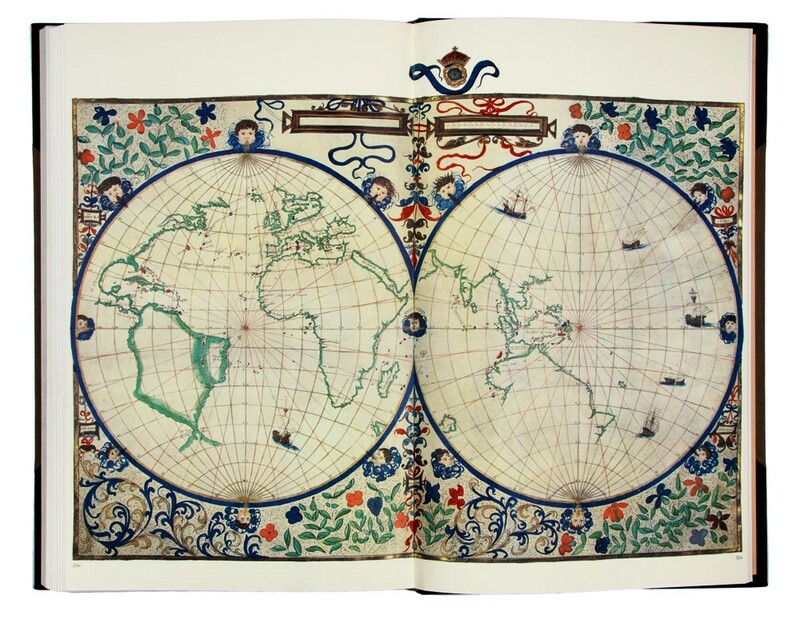 Vallard Map 1547. The North island of New Zealand? There is a possibility that both Iberian nations voyaged to or were wrecked in New Zealand in the 1520s, with sixteenth century maps with coastlines similar to New Zealand and Australia, appearing on world maps from the 1540s. 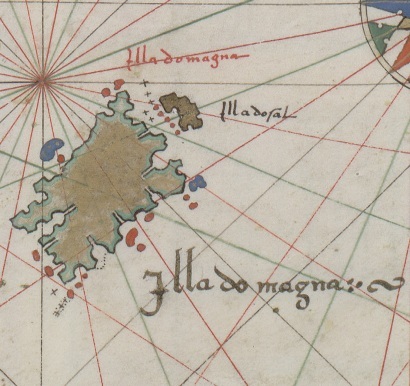 On the most detailed map, the Vallard of 1547, over 120 Portuguese place names appear on landmasses where modern day Australia and New Zealand are located, and in some places, the place names describe physical features that still appear in places on those maps today. There is, however, currently no ship’s journal making these discoveries definitive – a sighting of New Zealand was not recorded by a European until 1642. 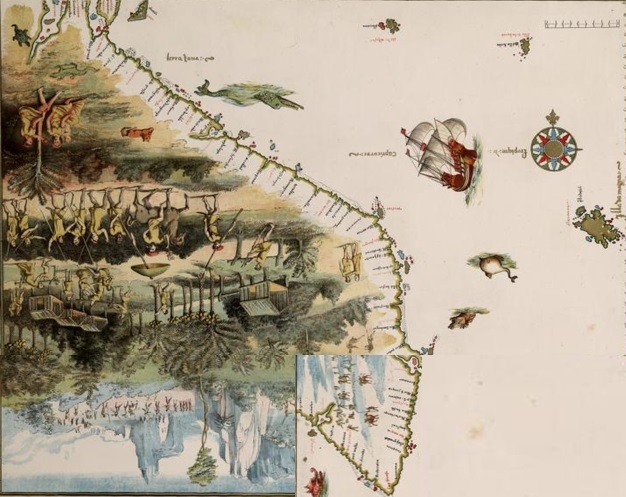 In 1642 the Dutch explorer Abel Tasman sailed in search of the southern continent, which sixteenth century maps indicated was located in the South Pacific. Dutch merchants hoped this land would offer new opportunities for trade. Tasman discovered New Zealand on 13 December 1642, but after a bloody encounter with Māori in Golden Bay, he left without going ashore. Shortly afterwards, a Dutch map maker gave the name Nieuw Zeeland to the land Tasman had discovered. The English navigator Captain James Cook sighted New Zealand on 6 October 1769, and landed at Poverty Bay two days later. He drew detailed and accurate maps of the country, and wrote about the Māori people. His first encounter with Māori was not successful – a fight broke out in which some Māori were killed. However, after this Cook and his men had friendly contact with Māori. The naturalists Joseph Banks and Daniel Solander, who sailed with Cook, gathered a great deal of information about the country’s plants and animals. Their records formed the foundation for the modern study of New Zealand botany. On two later voyages, Captain Cook used New Zealand as a base to prove that a great southern continent did not exist in the Pacific. Citation: John Wilson and Winston Cowie ‘European discovery of New Zealand’, Te Ara – the Encyclopedia of New Zealand, updated 10-August-16. I have some comments on the ‘Before Tasman’ section. As always, comments are well intended with a view of bringing knowledge forward. My view is that this sentence can be improved a little semantically – as the way it reads, it could be interpreted to mean that both Spanish and Portuguese ships sailed out of Callao, Acapulco and the East Indies. As you are aware, given the treaties of Tordesillas and Zaragoza, it was the Spanish that sailed out of Callao and Acapulco with the Portuguese sailing out of the East Indies. My view is that these two sentences can be improved by referring to the circumstantial evidence that support the Portuguese and Spanish case – maps, the existence of artefacts and a skull, and oral tradition, as opposed to ‘fragmentary information found in Portuguese and Spanish archives’ which doesn’t reflect what the evidence is or where that information is located. Similarly, none of the navigators put forward as the navigators who may have voyaged to New Zealand are included – Christopher Mendonca (Portuguese) and Juan Fernandez (Spanish). Alternative Proposal: An earlier discovery? Spanish ships sailing out of the Philippines and Central and South American ports (Acapulco, Callao and Concepcion), and Portuguese ships sailing from the East Indies (Malacca and Ternate), may have reached, or become wrecked on the New Zealand coast. Whilst no one before Tasman reported the discovery of new land that can be identified as New Zealand, circumstantial evidence including maps, references to voyages in archives, oral tradition, and artefacts suggest at least the possibility of earlier Portuguese or Spanish arrivals. It is theorised that the ships that came closest to New Zealand before 1642 may have been those of the Portuguese navigator Christopher Mendonca (1522-24), that of the Spaniard Juan Fernandez (1576-78), with the wreck of a Spanish caravel, the San Lesmes, also a possibility in 1527. The expeditions of Spanish navigator Alvaro de Mendaña de Neyra (1595) and Portuguese mariner Pedro Fernandes de Queirós (1605–06), which touched the northern Cook Islands, are also possibilities. It is unlikely that Arab or Chinese ships, which were trading in the South China Sea and Indian Ocean, were ever off the coast of New Zealand. My view is that the way this section is written, it appears to try and distance Portuguese and Spanish navigators from the south to make room for the ‘Terra Australis Incognita’ myth. E.g. This Terra Australia term has its origins in theory with the likes of Aristotle, Ptolmey and Cicero – centuries before this – there is no need to suggest that space needed to be left for it – as consistent with the theory that the southern continent was needed to balance the globe, it was already appearing on maps prior to Mendana and Queiros’ voyages. As such, I propose that the following wording be used to describe the Terra Australis Incognita. Alternative Proposal: Terra Australis Incognita? The discovery of New Zealand and Australia has always been bound up with speculation about the ‘Terra Australis Incognita’ – the ‘great southern unknown’ landmass, originally theorised about by the likes of Aristotle and Ptolmey. It was considered that a southern landmass was needed to counterbalance that in the north and even given the existence of the sixteenth century Portuguese maps and Tasman’s maps in this part of the world, it wasn’t until the voyages of Captain James Cook that the myth was finally dispelled. Citation: John Wilson and Winston Cowie ‘European discovery of New Zealand’, Te Ara – the Encyclopaedia of New Zealand, updated 10-August-16. I would be most grateful for your view and response, Te Ara, to my question and proposed text amendments. May I also state how professional and responsive I have found you in this korero, Te Ara. When-ever I have messaged there has been a prompt response. I am grateful to you and thank you once again for serious consideration of what has become an important national korero. This entry was posted in Uncategorized and tagged Christopher Mendonca, Conquistador Puzzle Trail, European discovery of New Zealand, Juan Fernandez, New Zealand author, New Zealand authors, New Zealand History, New Zealand history author, New Zealand history authors, Portuguese discovered Australia, Portuguese discovered New Zealand, Pre Tasman explorers, Spanish discovered New Zealand, Spanish voyaged to New Zealand, Winston Cowie, Winston Cowie Author by wcowie. Bookmark the permalink.